Home » What is Affiliate Marketing? Excellent post. 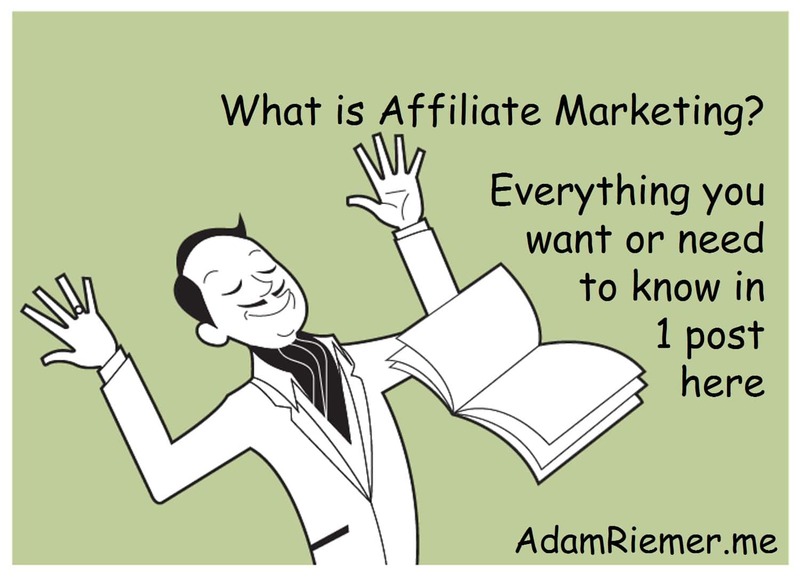 Thanks for sharing this detailed explanation regarding affiliate marketing. This will help the beginners to completely know about Affiliate Marking and how to work on it. Thanks for sharing this great post. This is absolutely the best article I’ve seen on Affiliate Marketing in a long time. You didn’t leave out any details and were fast to the point with no fluff. Great article! I’d just like to add that no matter how long it takes to be successful in affiliate marketing it’s well worth what ever it takes to make it. Forget trying to be a millionaire with affiliate, find a way to make $50k a year and it’ll change most peoples lives. Adam, I have to give you a big hug, because over the past few months I have been researching online how to make money from home. I have gathered so much information to the point that it has all become one big giant ball of twine. I feel like I am always back where I started. I have had your article for months and I am just now getting to it because I was going in the order I received them. Your article has done more for me in an hour than 200 hrs of research. I agree with Jim your straight to the point, no tidbits of info to leave me scratching my head. I bet you are a no-nonsense kind of guy and that is a genuine quality and that quality in you is perceived even in your writing. Thank you so much looking forward to more of your straight shooting articles. You seems to be a master in this subject as you have gone in depth to tell your readers the pros & cons of affiliate marketing. I liked your research related to the landing pages, the type of audience you should have, as all these things are very important. One of the most important & ignored thing which you have highlighted is affiliates not putting much of the effort for what it takes to become successful. Most of the information is split between Affiliates or Publishers and Advertisers. Hi Adam, This was so far the best and most detailed article on affiliate marketing that I’ve read in the past years. I must say that you did a great job in compressing everything in such a short article. This helped me soo much. Thanks again.